It made me wonder what the original Kikstart game was like, so I checked it out on the World Of Spectrum database. It turns out that the game’s most notable feature is that it doesn’t exist. There is no game called Kikstart for Kikstart 2 to be a sequel to. And it’s not that it’s simply missing from the World Of Spectrum database. The WOS is ridiculously comprehensive, containing entries for software that only appeared once in a small-ads page in some long-forgotten magazine, which might not even have existed in real life. I thought that this was a bit weird, but hey, if one word could describe ZX Spectrum games generally then “weird” wouldn’t be a bad choice. Besides, I had a lot more games to get through so I didn’t think too much about it. But then a little while later I came across the game Speed King 2. This also turns out to be an orphaned sequel, with there being no game called Speed King. And then a little while later still, I came across the database software Figaro II which was also an orphaned sequel, with no original Figaro. Intrigued by this, I decided to see exactly how many games there were which were orphaned sequels. So a little Google-fu later, I had added to the list Falcon Patrol 2, Tom & Jerry 2, Xeno II (bizarrely there is an unrelated Xeno, released three years later by a different publisher), Star Raiders II, Sidewinder II, and The Duel: Test Drive II! This list only includes software released in English, and published commercially. Plus, it doesn’t include things like games of sequel movies, or games where the “2” in the title is obviously part of the title, rather than indicating a sequel (such as Genesis II, which concerns a colony spaceship called Genesis II). I couldn’t find any orphaned threequels. The only non-sequels were games of threequel movies (Death Wish 3) or games with a “3” in the title which were part of the title (Mach 3). So, um, why? Why did they do that? It seems that at least some of these were Spectrum ports of games from other computer systems, which were sequels to original games on the original system – Such as Kikstart on the C64, or Star Raiders on the Atari 8-bits. This explains some of these orphans, but not all. Some were only ever released on the ZX Spectrum. Indeed, Test Drive II is only an orphaned sequel on the ZX Spectrum. Accolade originally wrote Test Drive for PCs, and Test Drive II was the follow-up. 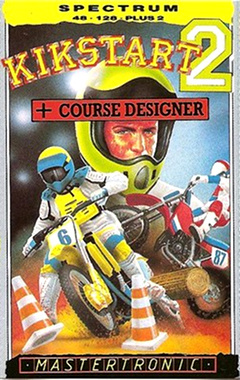 Likewise, and as you yourself noted, Kikstart (its full title is Kikstart: Off-Road Simulator) was only ever published for Atari and Commodore, but its successor was published on ZX Spectrum as well. No doubt most of the other titles you mentioned have a similar history. Amusingly, Speed King was released on Commodore, Amstrad, and MSX; but Speed King 2 was ONLY released on Spectrum.